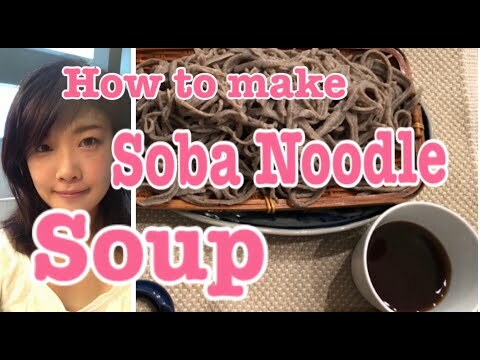 how to make dashi before on this page but this Sanuki udon Japanese noodle soup dish soup use different ingredients. 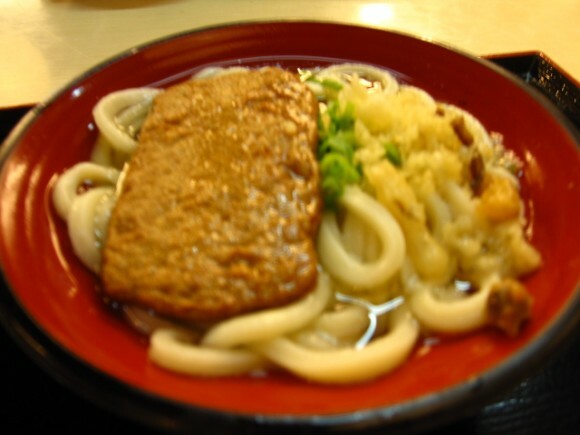 If you want to know more about Udon, see this page. 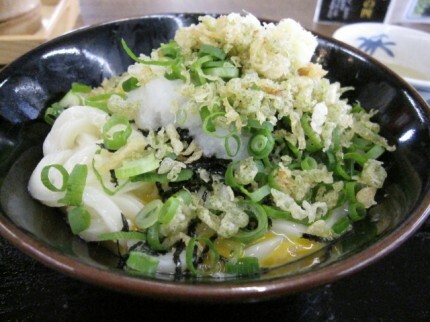 This picture is Udon and raw egg. The udon was just cooked from boiled hot water so it cooks raw egg in this bowl. I put topping ground ginger and negi (onion) and Agedama. It comes with dashi in the small container. You pour that before you eat it. It was VERY GOOD! It’s called KAMATAMA. 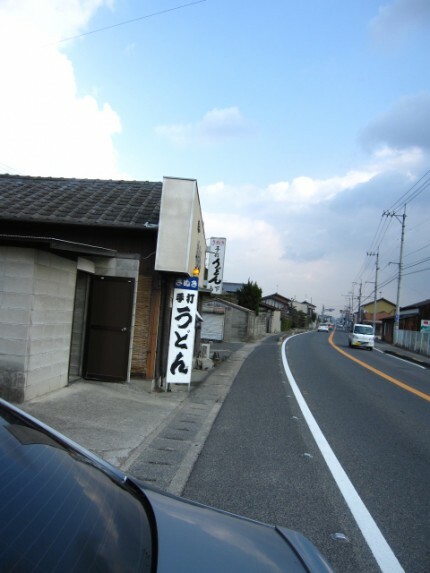 (kamaage udon and tamago=egg) Around Tokyo, there is Mizusawa udon and this is close to where my mother grows up with so Mizusawa udon is the more familiar to me. 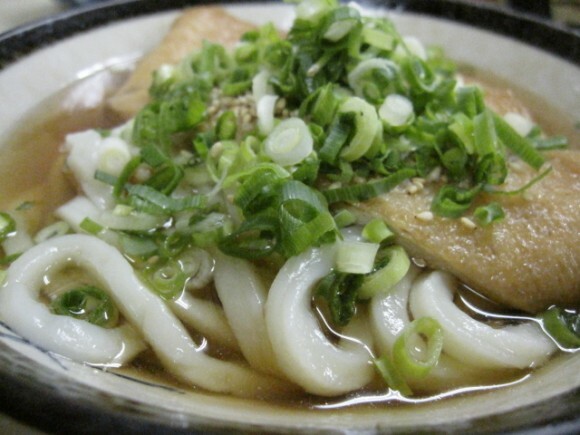 By the way, Mizusawa udon is one of three famous udon in Japan. And this is a very East-side type of taste of Udon. 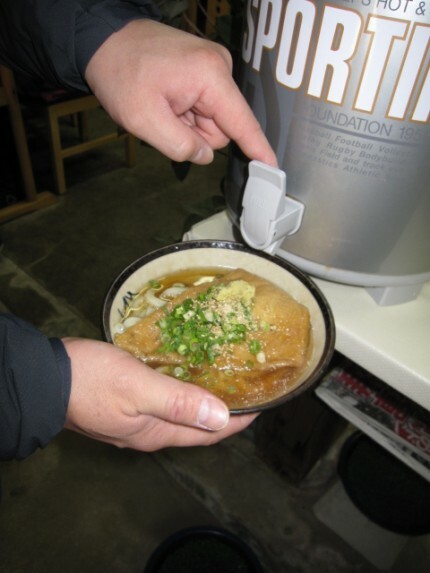 See this page for very intereting dashi color change where you go to West to East. East (Tokyo) is darker in color, and West (Kyushu) is lighter color. Osaka is left of the pink arrow on the picture. Tokyo area usualy uses Katsuobushi (bonito flakes) for dashi (broth). Kansai (Osaka) area uses Konbu (sea weed) dashi and Shikoku area uses Iriko (sardine) dashi. Iriko is baby dried sardine and I often use them for my Japanese cooking. Bonito and Konbu are kind of a delicacy in taste for cooking but Iriko is more likely ordinary mother’s taste. 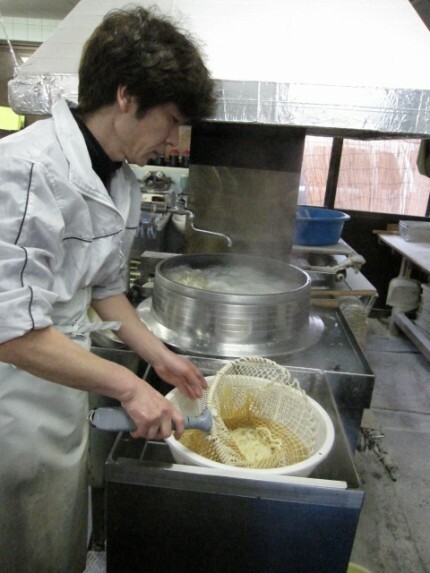 However Sanuki udon uses a high gluten noodle needs strong dashi flavors. 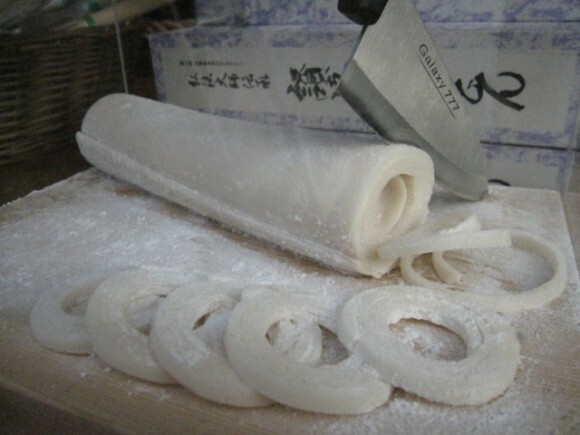 Also Kagawa in Shikoku is the district the Iriko is the caught so they use strong Iriko dashi for Sanuki udon. 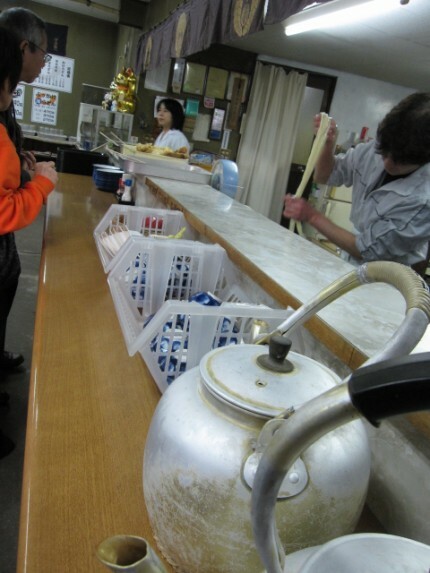 I have been in the United State so long, I have never went to a self service Udon restaurant. 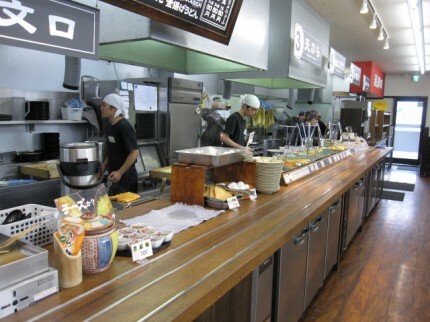 They started self service udon restaurants in Tokyo area about 15 years ago. I think it is like Japanese fast food like American McDonalds. Any way, this is my first time going to a Self service Udon restaurant. You can choose the Udon topping. when i asked him to taking a picutre, he smiled at camera, thanks! this is like American Cafe (like college cafe self-service) you can pick Tempura, Tonkatsu, Eggs, Korroke and put on your Udon or side. 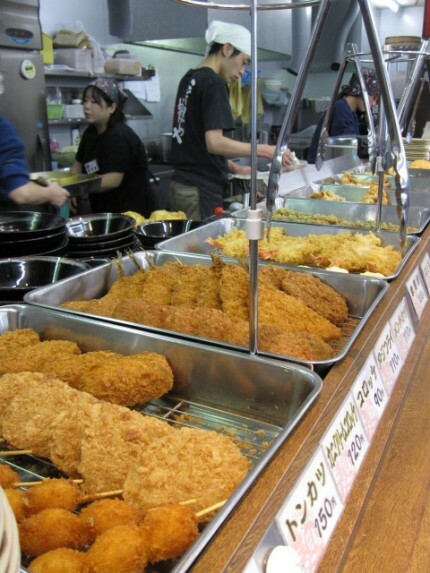 And if you want, you can buy Onigiri (rice ball) or other things. 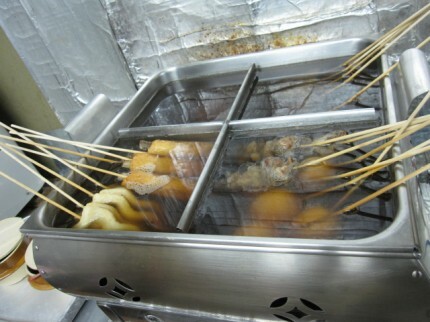 They have Oden, too. 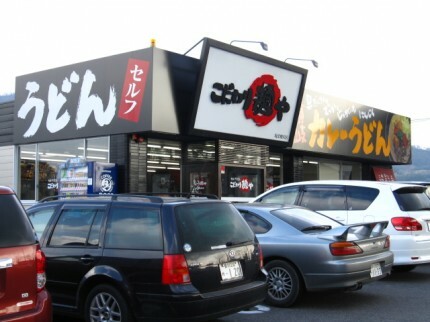 This is the other restaurant Udon. I choose Tempura, but this tempura is not what you think. This is not what Amrican know from Japanses restaurant Tempura. There are also free toppings. there are ground ginger, agedama (same as Tenkasu: crunchy bits of deep fried flour-batter used in Japanese cuisine, for example in takoyaki,okonomiaki, and udon. Tenkasu is also called agedama), long onion, sudachi. 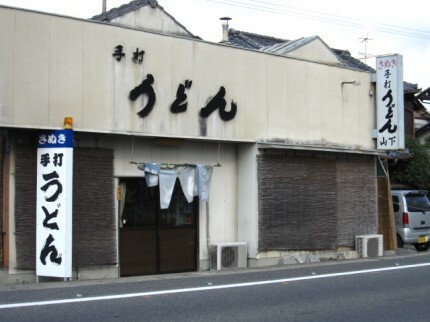 This is an other Udon restaurant, but this is like a Mom and Pop restaurant. Customers keep coming in to eat udon for about 15min and leave. They don’t stay long. Yes just like fast food restaurant. 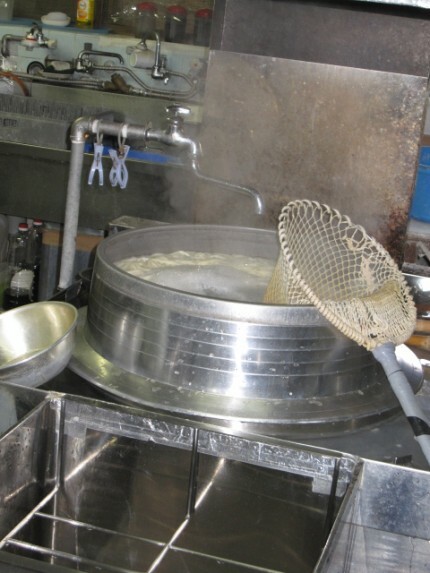 You are pouring Udon dashi soup into your bowl. Self-service. This is Oden, you can pick the stick. It seems like you had a very nice trip back to Japan. I think I would like to eat at all of the Udon places. I especially liked the one that is like a college cafeteria. There is so much to choose from. I like the Onigiri. I like noodles. I liked fried food. YUMMY!!! Michelle, yes it will be fun to visit all those shops (restaurant). 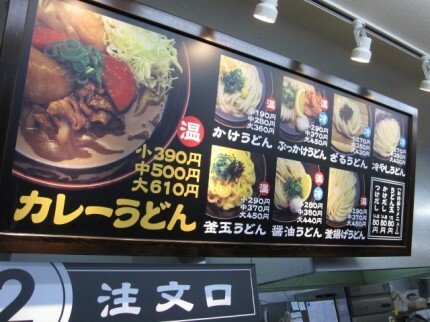 Did you see the sign, one bowl is 190 yen (most unexpensive one). 190 yen is about $2.50 for one bowl of Udon noodle! The price is also very good. I would eat udon every lunch if I were live there. Self service udon?!! Wow! I must try that if ever I am in Japan. I love the pictures by the way of all the delicious udon bowls. 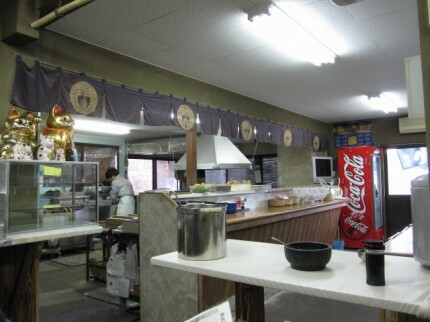 What was your favorite udon bowl over there? The noodle guy, thanks for dollop by. I can not find udon bowl here in Charleston. so I don’t have my favorite udon here. Hey Yuri, thanks for posting this Japanese delicacy. I am very much in fond of Chinese fond, and I know Japanese food is more than Sushi, and you proved it by posting this recipe here. I am in love with your noodle soup recipe. Hi Steph, thanks for visiting my webpage. Your page is great! I am into the vegan now so if i can find a recipe from your website? if you have any recommendation, let me know? thanks.